Guess, Abercrombie & Fitch, and Qualcomm face several risks in the near future. Income investors are often drawn to high yields like moths to a flame. But prudent investors always check the payout ratios -- the percentage of a company's earnings or free cash flow that a company spends on dividends. If those ratios exceed 100%, that dividend is probably unsustainable in the long run. Moreover, if a company's earnings and free cash flow growth are declining, the dividend and stock price could both be due for a haircut. 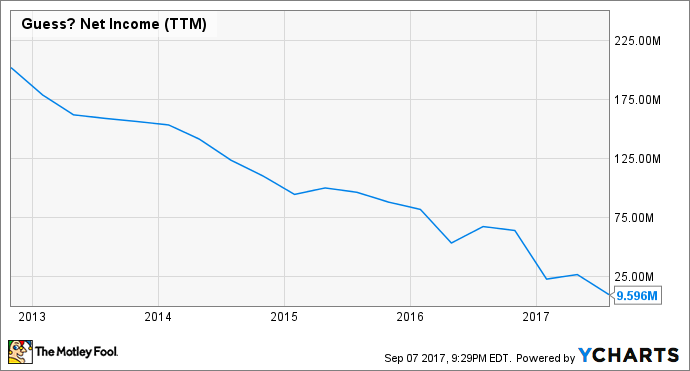 Let's examine three dividend stocks that fit that description: Guess (NYSE:GES), Abercrombie & Fitch (NYSE:ANF), and Qualcomm (NASDAQ:QCOM). 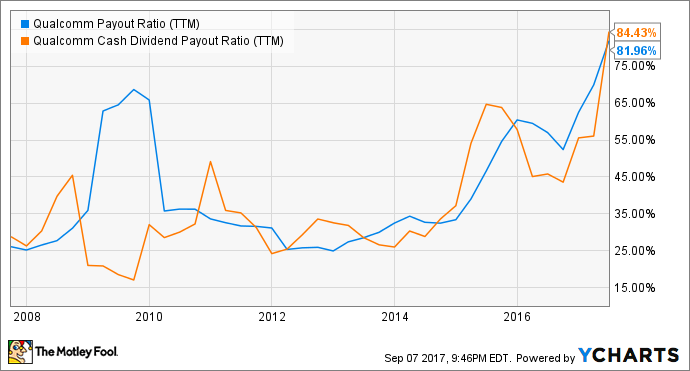 Guess pays a forward dividend yield of 5.6%, but it hasn't raised that payout for over three years. The company spent 397% of its earnings and 115% of its free cash flow on that dividend over the past 12 months. That dividend doesn't look sustainable, yet CEO Victor Herrero frequently tells investors that he reinvests all his dividends back into Guess stock. Guess admittedly made some progress in a tough retail apparel environment over the past year. Its sales growth in Asia and Europe offset ongoing declines in the U.S., helping the company post four straight quarters of annual revenue growth. Expanding margins in Asia and Europe are also offsetting weaker margins in the U.S. business -- which is being "reinvented" -- but Guess' net income growth remains in a downward trend. Analysts expect Guess' revenue to rise 6% this year, and for its earnings per share to jump 32% as buybacks kick in. However, the stock still trades at 147 times trailing earnings and 27 times forward earnings -- which looks much pricier than the industry average of 21 for apparel retailers. Abercrombie & Fitch faces similar headwinds as Guess -- the rise of fast fashion rivals like Zara, fickle consumer tastes, e-tailers, and sluggish mall traffic. A&F posted 18 straight quarters of annual revenue declines, and its bottom line remains deep in the red. Despite that lack of profitability, A&F pays a forward dividend yield of 5.9%, which gobbled up 112% of its free cash flow over the past 12 months. The company also hasn't raised that dividend since 2013. 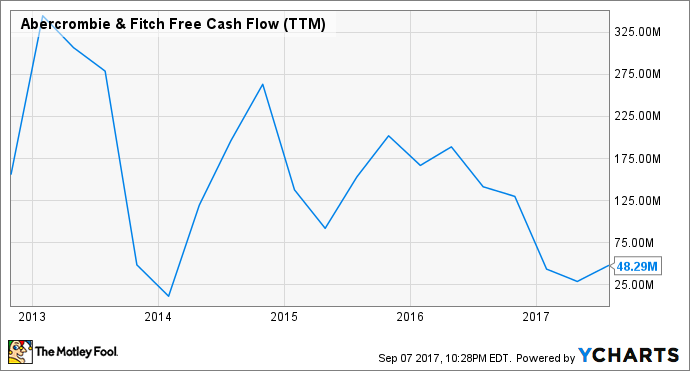 A&F's waning cash flow growth over the past few years also indicates that the dividend could be cut. Also like Guess, A&F has made some headway in recent quarters. Comps, while still negative, have improved sequentially. The company finally appointed a permanent CEO earlier this year, and it's been introducing new looks, putting more emphasis on its stronger Hollister brand, altering the layout of its stores, and using more "inclusive" advertising campaigns. The stock also looks very cheap at 0.3 times trailing sales. However, A&F's turnaround is hardly a sure thing, and investors looking for a good dividend play in apparel should stick with American Eagle Outfitters, which has positive comps growth and a sustainable dividend. I've recommended Qualcomm, the world's top mobile chipmaker, as a safe dividend play in the past. It pays a forward yield of 4.5%, and it's raised that payout annually for 14 straight years. It spent just 82% of its earnings and 84% of its free cash flow on those dividends over the past 12 months. Those big jumps were caused by a big drop in earnings over the past year. Qualcomm's high-margin licensing division, which generates the lion's share of its profits, remains besieged by government regulators and OEMs demanding lower licensing fees. Apple and another major OEM recently stopped paying those fees altogether, which could encourage other licensees to follow suit. As a result, analysts expect Qualcomm's revenue and earnings to respectively drop 2% and 6% this year. Qualcomm's 23% decline this year wiped out any dividend-related gains. Its trailing P/E of 19 and forward P/E of 12 look reasonable relative to the industry average of 24 for semiconductor makers, but the stock is cheap for clear reasons. As with all of these stocks, income investors should understand the risks involved with Qualcomm before they invest.